The history of Honda's works participation in the Coupe d'Endurance races during the years 1976 through 1980 is not as interesting and glamorous as the history of their "Golden Age" of Grand Prix racing during the sixties. There are a couple of reasons for that. In the first place, the number of events per year, six, later, in 1980, when the series got world champion status, (1980) some more compared to the eleven to twelve events in the case of the GPs, and the fact that the Grand Prix series were about a world title - the Coupe d'Endurance was a European affair until 1980. Then there were the bikes. During the sixties, the racing scene was dominated by the three Japanese firms Honda, Suzuki and Yamaha, with MV struggling in the 350 and still winning in the 500 cc class, and a number of other factories still in the fight - Jawa, MZ, Benelli, AerMacchi, Norton, AJS and Matchless to name the most important. Razor sharp competition saw the emergence of screaming single, twin, three, four and even six cylinder engines, with ever rising engine speeds, which made it a time highly interesting not only to the spectators but also to the technically interested. 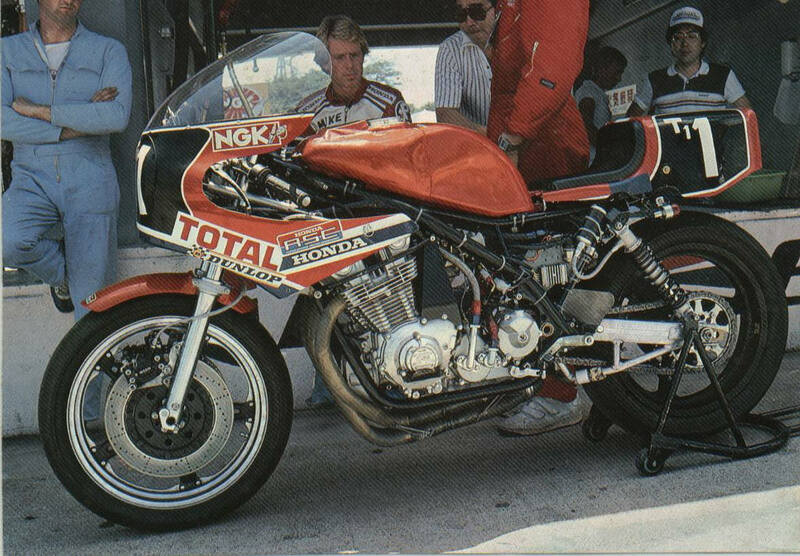 Compared to those exotic machines, the endurance racing dominating Honda RCB racers, derived from the touring CB750 and later from the CB900 Bol d'Or, were rather straightforward and not half as exciting as their GP predecessors. And, lastly, there was indeed their dominance. Participation in the Coupe d'Endurance was open to "improved" production motorcycles. However, the requirements were so vague, that the way was open to compete with practically completely new designs, and that possibility was rigorously exploited by Honda. Most teams in those days were "private", and to compete against the might of Honda was a daunting task. The result was that the series were totally dominated by the Honda RCBs, which in the end makes for less interesting racing. 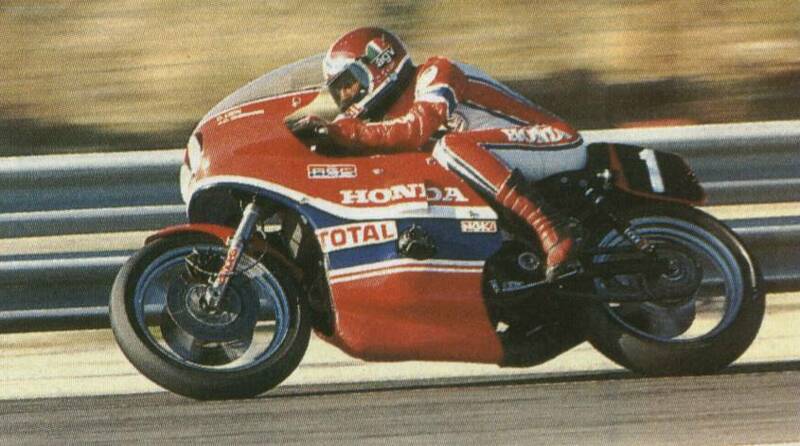 The only really interesting year proved to be 1980, but then Honda was plagued by stupid bad luck, especially with riders that fell off. However, it was still an interesting period, and most definitely an integral part of Honda's race history, so lets have a closer look at it. Excitement in the pits in the Dutch circuit in the dunes bordering the North Sea - for the first time in 9 years a real Honda factory team had arrived for the 6 hours endurance race. 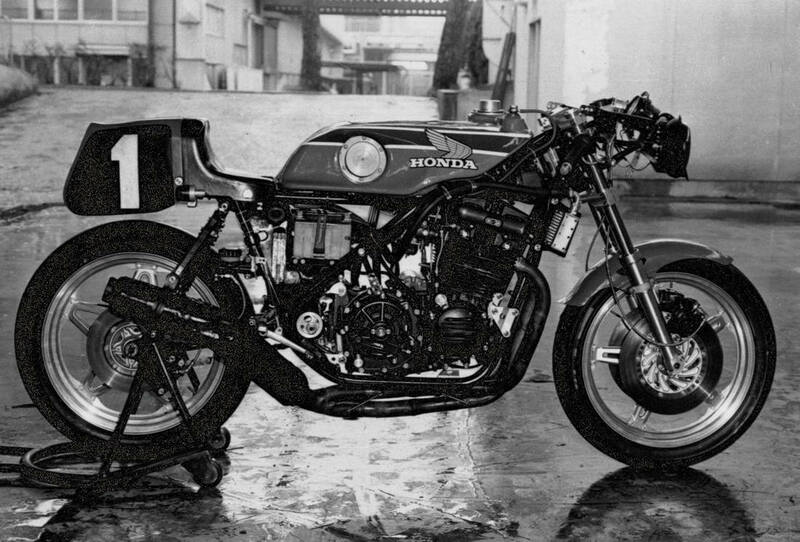 Honda had retired from GP racing in 1967, and although they had made a brief appearance for the Daytona 1970 200 miles race with the race tuned CB750R, that had not been a real "works" effort, and after winning that race the machines went back to Japan and were not seen again. 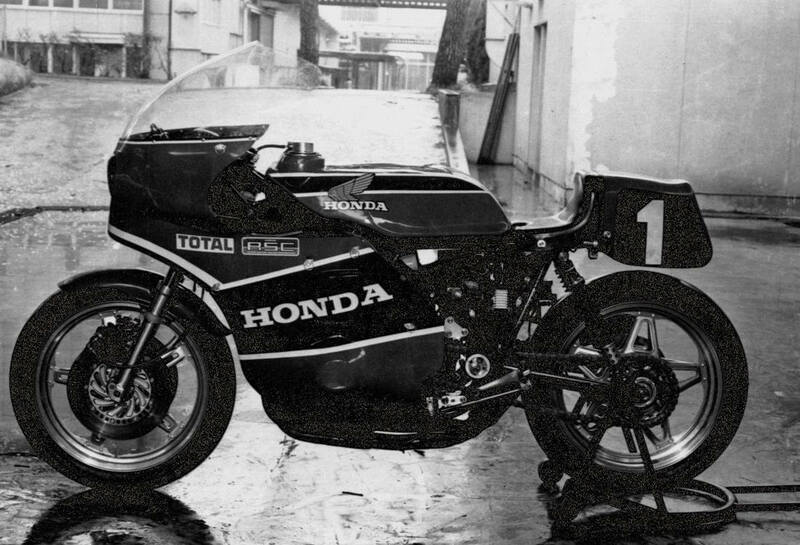 Then, late 1975, Honda announced that they would be returning to the circuits in 1976, but this time in endurance racing. As it so happened the Dutch 600 km race was the first endurance race that year, and it was there that the Hondas made their first appearance of the season. The effort was run and coordinated by Honda France under management of Jean-Louis Guillou. However, in Zandvoort the team showed up with two machines, riders Leon and Bowler, entered by Honda France, and Stanley Woods and Charlie Williams, entered by Honda UK, an English and a French pit crew and a large number of Japanese technicians and mechanics - a total of 31 people! Hardly any details of the machines were known, and the fact that the mechanics only spoke Japanese and a couple of words French didn't really help things. The race was won by Christian Leon and J. Bowler, who were much faster than the team Woods/Williams. The latter team also had ignition problems during the race, and, after falling back to 24th position, they retired. This race, however, was a non-championship event. The 1976 FIM Coupe d'Endurance started with the 1000 km of Mugello, followed by the 24 hours of Barcelona, the 24 hours of Liege in Belgium on the old Francorchamps circuit, the Bol d'Or in Le Mans and the season's closure at the 400 miles of Thruxton. The supremacy of the Honda RCB racers was so great that all the races were won by them. 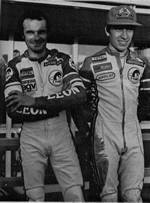 Christian Leon/Jean-Claude Chemarin won in Mugello, Barcelona was won by Woods/Williams with Leon/Chemarin second, but Leon/Chemarin won Liege. 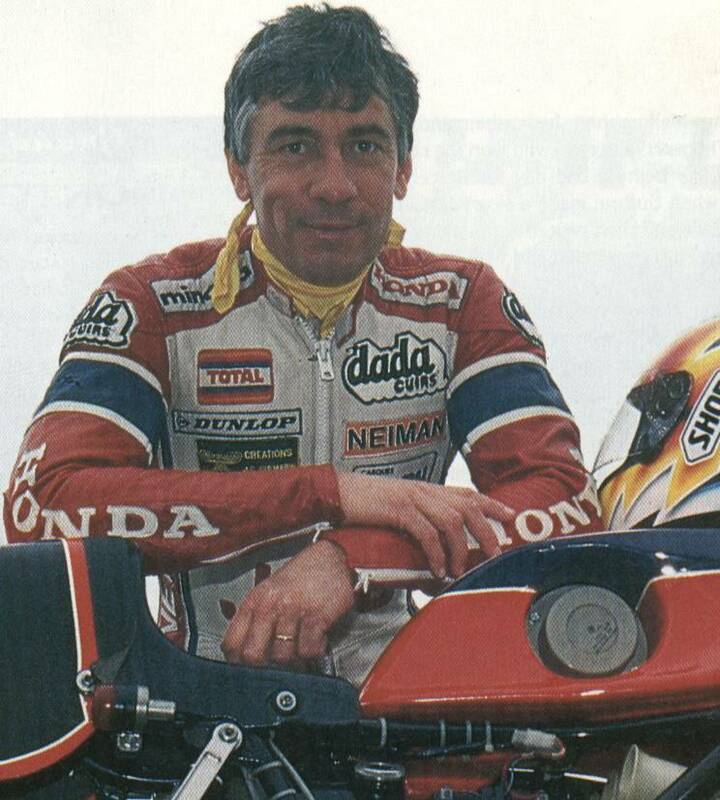 During training for the Bol d'Or Leon fell off and broke a collarbone, after which Alex George took his place. It made no difference - they won. This win gave Chemarin the European championship title. 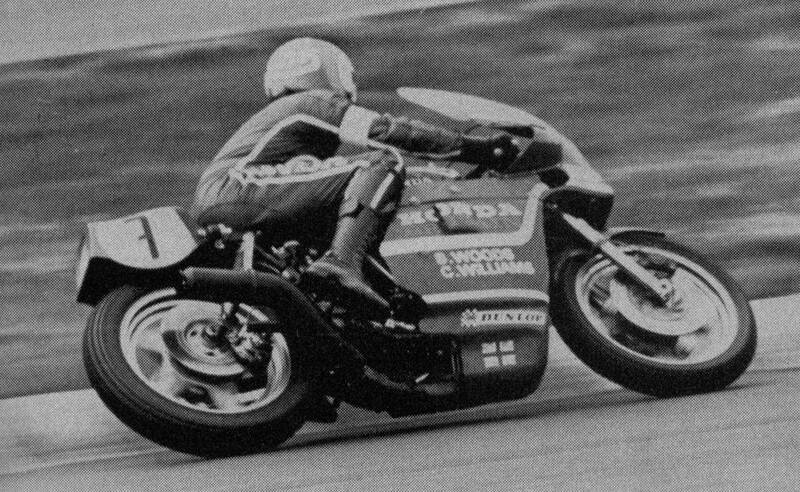 For Thruxton he teamed with Pat Evans, and came in second behind Christian Huguet and Roger Ruiz on another Honda RCB. 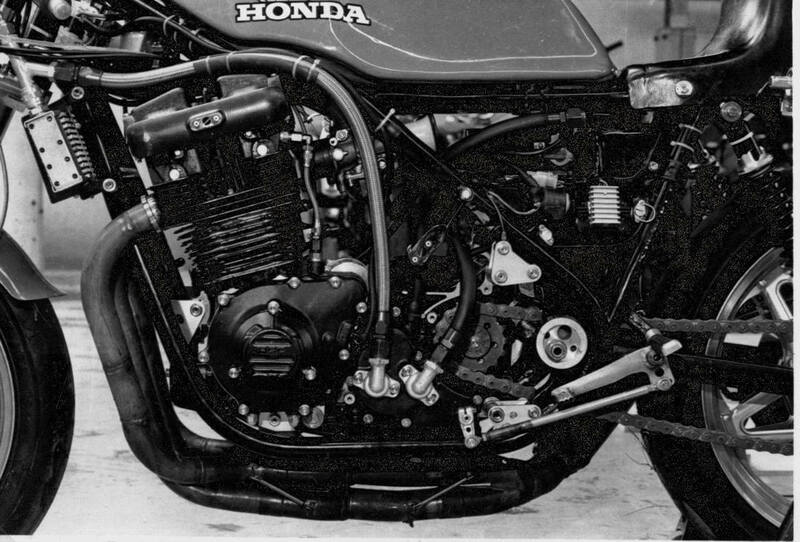 The engine of the Honda RCB1000 as it was known was based on the CB750 four, but with numerous modifications. A bore and stroke of 68 x 64.8 mm gave a total capacity of 941.3 cc (initially a capacity of 915 cc was mentioned). Compression ratio was 11 : 1, claimed power output 115 bhp at 9,500 rpm, although at least one bike was measured at 118 bhp with a torque of 10.2 kg.m at 8,500 rpm. 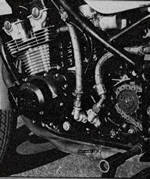 The horrible primary drive with two separate chains of the CB750 had been replaced with gears, which also drove the electronic CD magneto ignition, which sat on top of the crankcase, underneath the carburettors. See pic at left. 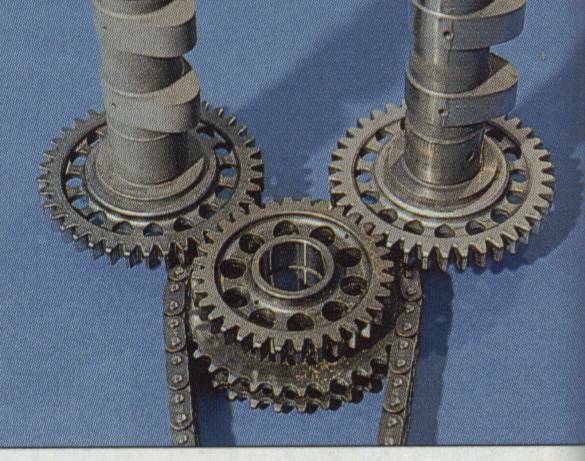 As can also be seen in this picture, the big-end and main bearings were plain bearings, and the driven gear on the primary gearbox shaft contained a shock-absorber. Diameter of the big-end bearings 36 mm, piston pins 17 mm. The pistons had two compression rings and one oil scraper ring. The left crankshaft end still wore the AC generator, but of a much smaller size than the original, and with an output of 150 W.
Carburation was by 4 Kei-hin carburettors of the constant vacuum type with 34 mm diameter (some sources say 32 mm), cast in magnesium and provided with long bellmouths and transparent float bowls. The exhaust system consisted of a 4-into-1 system, that initially gave some problems because it exceeded the allowable noise level. The gearbox was a five-speeder. On the back of the engine was the traditional breather dome, well known from the old GP and production racers. The crankcases were painted black (as were the cylinder block and head) and were said to be cast in an aluminium-magnesium alloy. There was no electric starter, the bike was kick-started. The dry-sump lubrication system contained 7 l oil, with an oil cooler under the steering head. The engine was housed in a well built, but traditional tubular frame, with telescopic forks and two conventional rear shock absorbers. The initially used French cast magnesium SMAC wheels were soon replaced with Honda's own "Comstar" wheels. Those wheels were built up from two-sided pressed stainless steel "spokes", riveted to spun aluminium rims. Brakes were double discs in front and a single disc at the rear. Tyre sizes 3.25/400 - 18 front, 3.50/5.75 - 18 rear. Total weight of the bikes was 187 kg, of which 87 kg was on account of the engine. Some sources say ten of these bikes were built, others say four. 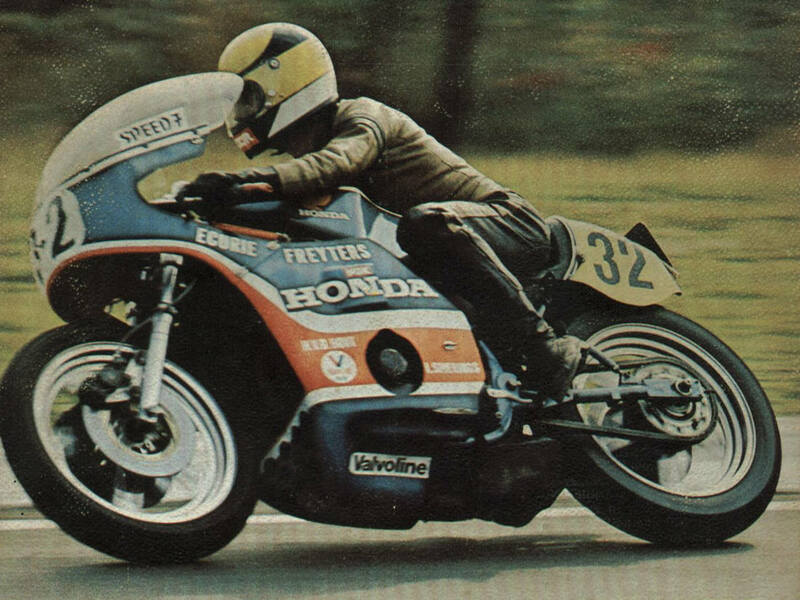 Fact is, that after the 1976 season, one bike went to Germany, one to Holland, one to Belgium and one to the Swiss Honda importer, while other teams showed up later using RCBs. Pics at right show the German bike (originally red parts were painted blue) with the SMAC cast wheels. The success story of 1976 was repeated, but to an even greater extent, in 1977. There were 6 championships races for the Coupe d'Endurance, and a number of non-championship events, of which Zandvoort was again the season opener. 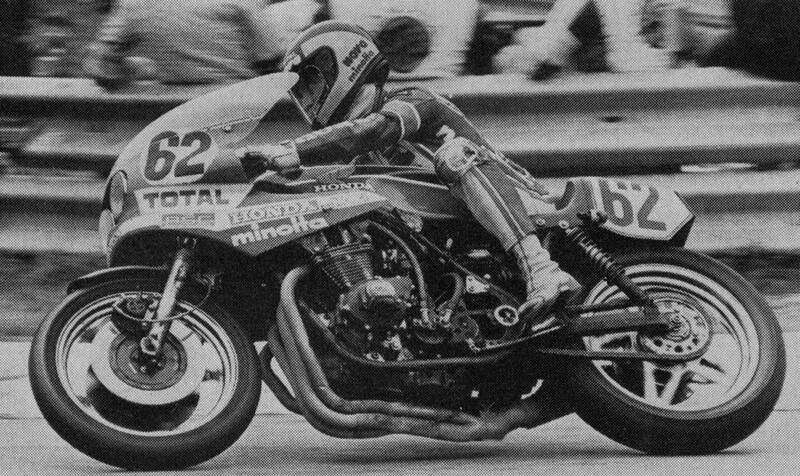 In atrocious weather, with rain and hail, Leon/Chemarin won the race on the new 1977 RCB, followed by Marc Stinglhammer/Jack Buytaerts (Belgium), Harry van den Hout/Leo Spierings (Netherlands), and Christian Huguet/Jacques Luc (France), all on Honda RCBs. To give an example of the pitwork: the changing of a rear wheel took 30 seconds, changing the front wheel a mere 15! The championship opener was in Misano, were Leon and Chemarin led the race until, in the 120th lap, Chemarin fell off because of oil on the rear tyre. 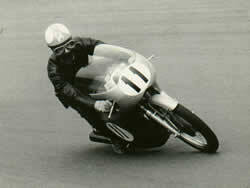 Subsequently the race was won by Green/Maingret (GB), followed by Stan Woods/Charlie Williams (GB), both teams on Honda RCB. The oil system was definitely a weak point of the RCBs, and gave (leakage) problems on several occasions. The 8 hours race on the Nuerburgring was won by Woods/Williams, this time Leon fell off. At right See pic of Woods. Next was the 24 hours of Barcelona, won by Christian Huguet/Pentti Korhonen, 2nd place was for Leon/Chemarin, 3rd J. Luc/Benjamin Grau, 5th Stinglhammer/Buytaerts, 6th Tuxworth/White, all on RCBs. The non-championship race at Paul Ricard was won Leon/Chemarin, followed by Luc/Vial. The 24 hours of Liege was for Jacques Luc/Pierre Soulas, with Leon Chemarin 2nd, Schneider/Dyrda 3rd, Mooster/Burki 4th, and Woods/Williams 6th, all on RCBs. The Bol d'Or, considered to be the most prestigious and important race of the endurance calendar, was won by Leon/Chemarin, with Korhonen/Huguet 3rd, Helmut Daehne/Egid Schwemmer 4th, Bardi/Ferreira 5th, Buytaert/Stinglhammer 6th and Spierings/Van den Hout 7th. Last race of the season was the 500 miles of Thruxton, won by Woods/Williams, followed by Huguet/Korhonen, Leon/Chemarin, Rutter/Marshall and Luc/Soulas, again all on RCBs. Again all championship races were won by Honda RCBs. The European championship was won by Leon/Chemarin, followed by Woods/Williams, Huguet/Korhonen, Green/Maingret, Soulas and Luc - an excellent result for the Honda RCBs. For 1977 the bore was increased to 70 mm, bringing the total capacity to 997.5 cc. Carburettor diameter 35 mm. Claimed power rose to 125 bhp at 9,000 rpm, and the top speed was over 270 km/h. The AC generator disappeared from the crankshaft and was placed on top of the crankcase, together with the ignition magneto. Many teams riding the '76 RCBs updated their machines in accordance with the '77 specifications. It appeared that a set of 35 mm Kei-hin carbs cost some US$ 6,800..yes, six thousand eight hundred! And we're talking 1977! The exhaust system was changed from 4-into-1 to 4-into-2-into-1. There was also a new, lighter frame, constructed in Reynolds 531 tubing, and through the extensive use of titanium and electron the total dry weight was reduced to just under 170 kg. The oil cooler moved into the nose of the fairing ........ (see pic at right). Some teams, using the '76 RCBs, used frames built by Dutch frame specialist Nico Bakker - see pic at left, some with excellent results, although at least one team, notably the Dutch, preferred the original Honda frame. 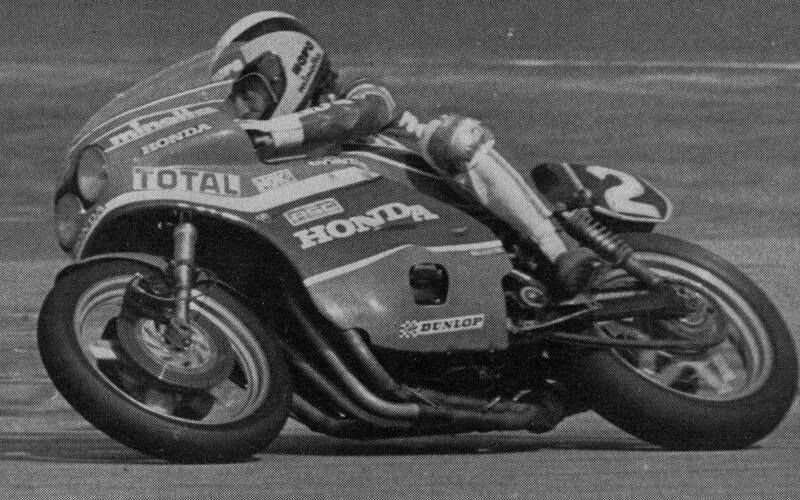 As had happened before, Honda reduced their works effort for the 1978 endurance season, and there was only one real works RCB for Leon and Chemarin, and one semi-works bike for Woods and Williams. Notwithstanding that, the Honda dominance was again total. Season opener was the non-championship 24 hours of Le Mans, which was won by Leon/Chemarin on the '77 RCB. The next race was the non-championship 600 km of Zandvoort, won by Woods/Williams on the new 1978 RCB, while Leon/Chemarin were plagued by clutch problems and finished fifth. Next was Liege, the first race counting for the European championship, which was, apart from the winners Jack Buytaert/Jacques Luc on a "private" Honda RCB, a total Kawasaki event - they were placed second, third, fourth and fifth. Leon/Chemarin's had to give up, leading the race, with unspecified engine problems. Since the new 1978 RCB had been giving problems in Zandvoort, the following three races in Liege, Misano and the Nuerburgring had been contested with the '77 model, but for the 24 hours race of Barcelona the 1978 RCB was used. While leading the race, Chemarin was hit by Palomo, who piloted a Ducati with Grau, and both riders fell off. Both machines were lightly damaged, but it took the Honda crew only ten minutes to get the bike going again, minus its fairing. Because of the delay, Leon/Chemarin were now in fifth position, but six hours later they were back leading the race, which they won with a new record number of laps. Second were Williams/Woods, third Luc/Buytaert, all RCB mounted. The Bol d'Or brought a surprise, in that from lap two the race was led by Patrick Pons and Christian Sarron on an OW31 Yamaha, with which they kept a constant lead of three laps over Leon/Chemarin. 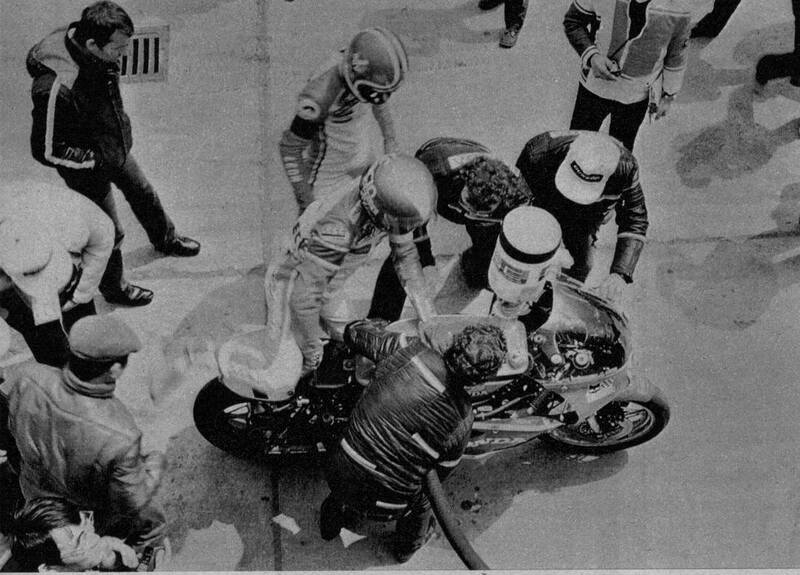 After some 17 hours, Pons suddenly increased the lead to six laps, but that proved too much for the Yamaha, resulting in a broken crankshaft. The race was then duly won by Leon/Chemarin, with Luc/Rigal second and Woods/Williams third, both teams on RCBs. Of the first ten teams, eight were Honda mounted. The Last race of the season was the 1000 km of Brands Hatch, which was won by Woods/Williams, with Leon/Chemarin second and Green/Murray fifth on RCBs. The European championship was again won by Christian Leon and Jean-Claude Chemarin (see pic at right of Christian Leon and Jean-Claude Chemarin), third was Charlie Williams Honda RCB), fourth Jacques Luc (Honda RCB), fifth Gary Green (Honda RCB) and sixth Roger Ruiz (National Moto) and Stan Woods (Honda RCB). All races during 1978 were won by Honda RCBs, except two non-championship events: Mettet by Cowie/Toleman on a Kawasaki and Suzuka by Cooley/Baldwin on Suzuki. 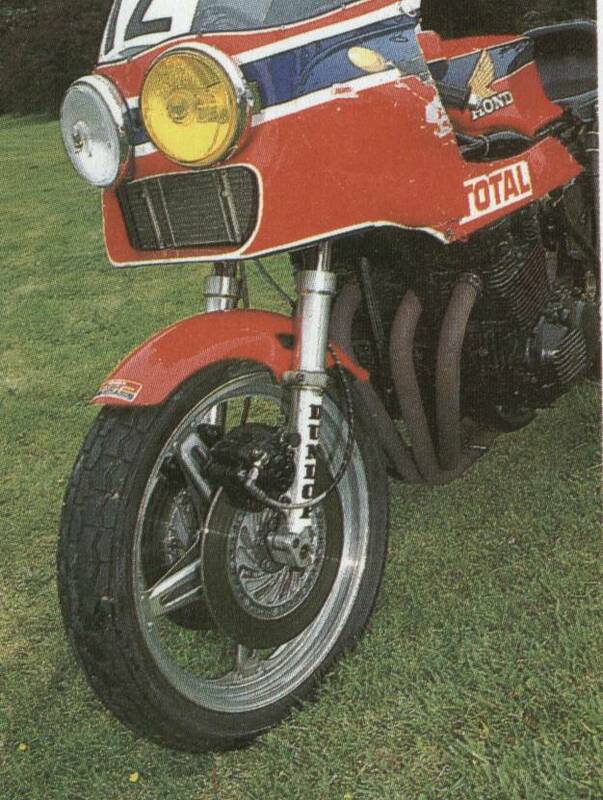 In 1978 the power output rose to 130 bhp. Ignition and AC generator moved to the ends of the crankshaft again, and the oil cooler was moved back to its place under the steering head. The clutch was now running dry, outside the crankcase. The season's start was this time in Le Mans, now counting for the European championship, and was won by Leon/Chemarin on the new 1979 RCB. Next race was the 6 hours of Assen, with championship status. The races were held in pouring rain, which saw Leon/Chemarin falling off twice, and that was even for this couple too much - with a damaged Honda they finished 7th, 9 laps behind winners Moineau/Huguet on a Kawasaki. The 8 hours of the Nuerburgring again saw Leon/Chemarin as the winners. How professional the teamwork had become is shown by the time of the pit stops: 8.2 seconds to tank, top-up the oil and change riders. see pic at right. Second place was for Daehne/Schwemmer on an RCB. The 24 hours of Liege was won by Luc/Buytaert, followed by Schneider/Dyrda, Oudin/Coudray, Van der Wal/Van Schijndel and Kockelmann/Scherer, all on Hondas. The Bol d'Or, still considered to be the most important race, did not count towards the championship this year. Leon/Chemarin won (although Chemarin fell off on the Sunday morning), 4 laps ahead of the Yamaha OW31 of Pons/Asami - Asami also fell once. 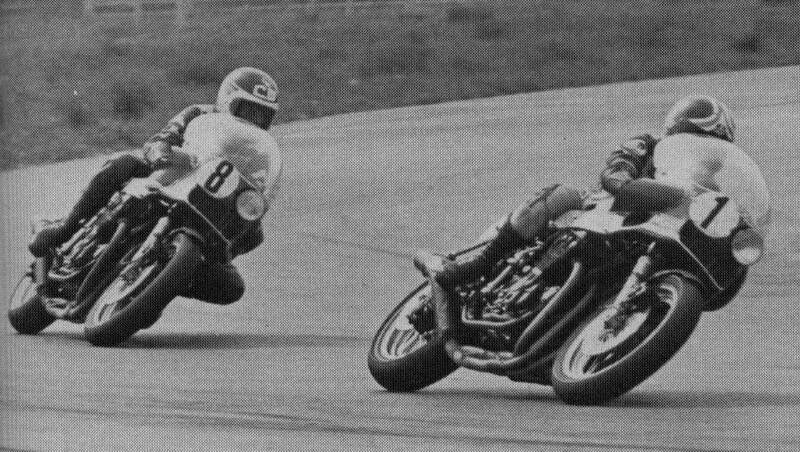 Last race of the season was the 1000 km of Brands Hatch, won by Huguet/Hubin on a Kawasaki 1000. Leon/Chemarin were not present, but that made no difference for them, since they were already European champions. It seemed that for some reason, there was no race in Barcelona in 1979, although it had been announced for 7th July that year. 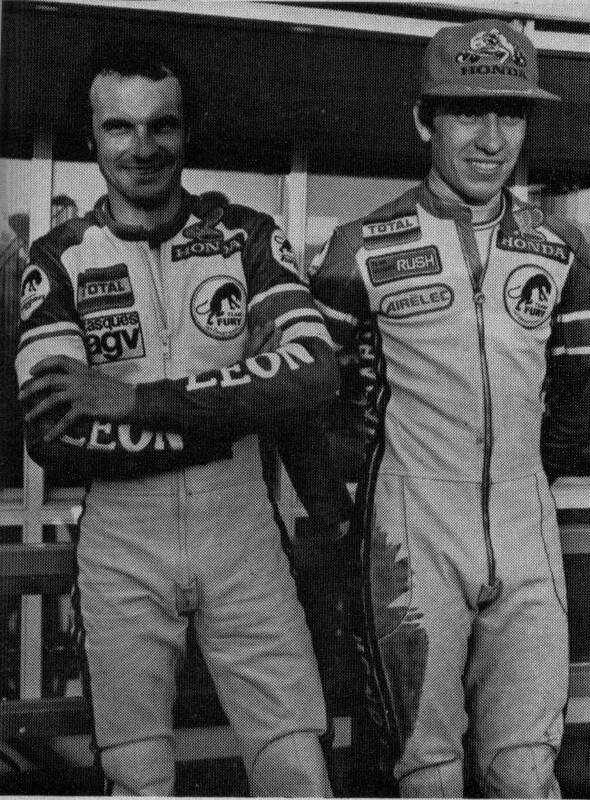 As already said, Leon/Chemarin were again European champions, followed by Huguet (Kawasaki), Jacques Luc (Honda), Herve Moineau (Kawasaki) and Jack Buytaert (Honda). 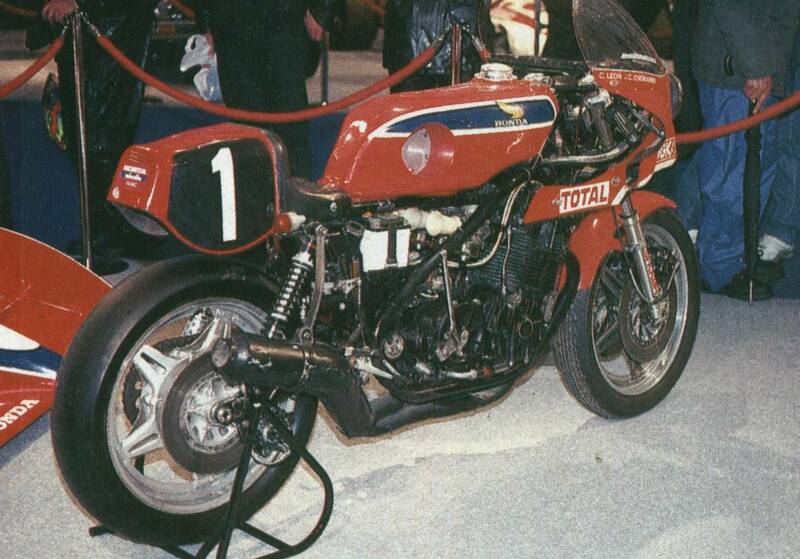 For 1979 the compression ratio was changed to 10.5 : 1, the power output was increased to 135 bhp at 10,000 rpm. The carburettors were changed for bigger ones (diameter unknown), and e.g. on the Nuerburgring Leon and Chemarin's bike had fuel injection. In order to make the very short pit stops possible, the kick started was replaced with an electric starter which weighs more but has time advantages. The clutch was moved into the oil bath again. The frame became 20 mm taller. Wheelbase 1465 mm, steering head angle 63 degrees, dry weight 177 kg. For the Bol d'Or, a second works Honda was brought into action with riders Hatton and Blake, entered by the Australian importer (see pic at left). 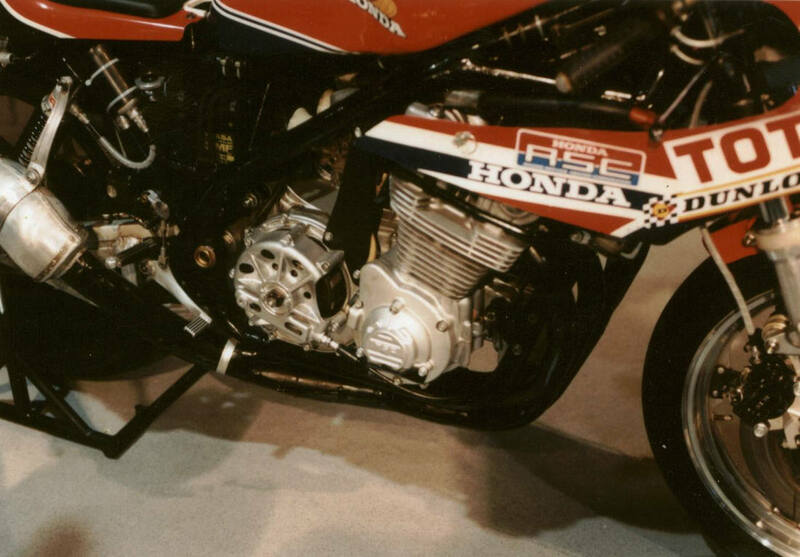 This bike had a bore and stroke of 70 x 69 mm, giving a total capacity of 1062 cc. 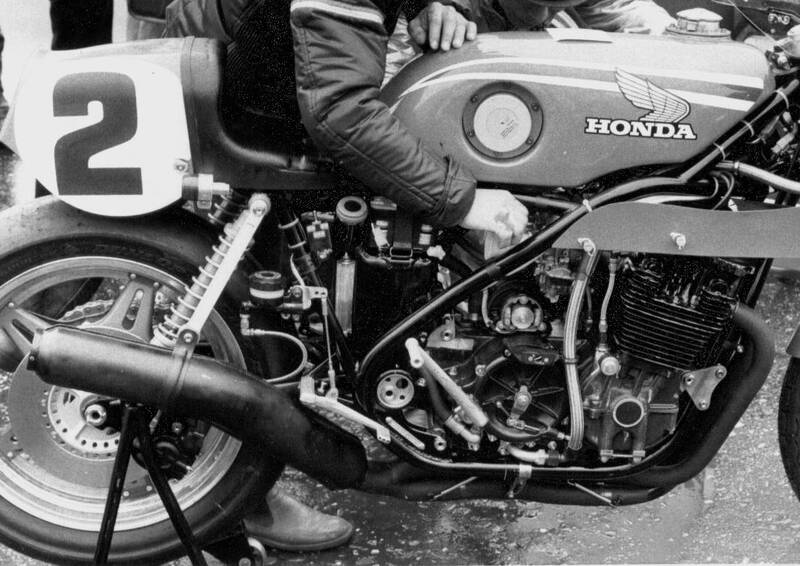 Leon and Chemarin's Honda's bore was enlarged from 70 to 73 mm at the same stroke of 64.8 mm, giving a capacity of 1084.9 cc. Both bike were clocked at 263 km/h on the straight. The weight was given as 160 kg, but during scruteneering the actual weight on the scales was 200 kg. 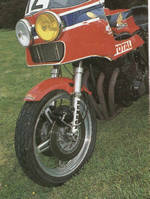 In 1980 the Coupe d'Endurance got at last world championship status, and a new formula was chosen. There was a class for machines from 600 to 1000cc and a class for prototypes (with more construction freedom) of 500 to 1300cc. There would be a winner per class and a winner overall. New rules and regulations regarding the engines came into being. Engines should be derived from normal production models. It was not allowed to change the stroke and the material and casting of the cylinder(block) and cylinder head - which meant no larger ports and/or valves. It was allowed to increase the bore. 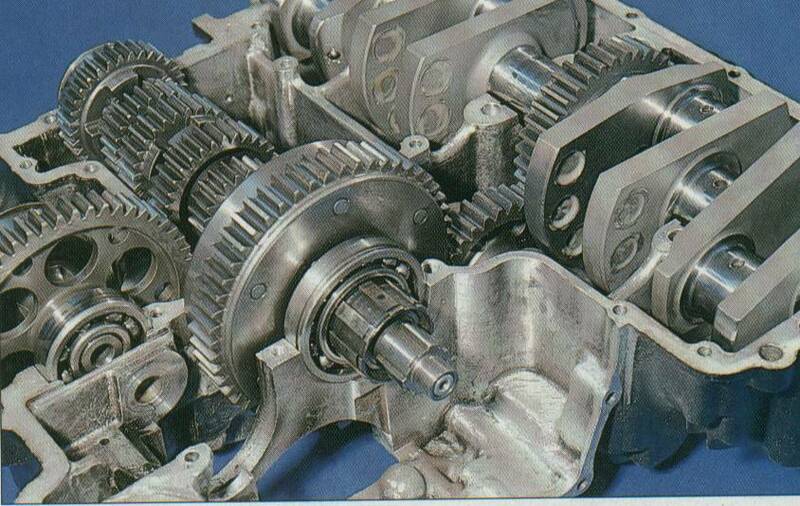 Crankcases and gearbox housings were not allowed to be changed, and gearboxes should not have more than 6 speeds. Carburettors had to remain standard, and the bikes had to run on normal commercial petrol. Maximum tank capacity 24 l.
Honda announced that they would compete with two machines, which were based on the CB900F, and were no longer called RCB 1000 but RSC 1000. Which is interesting: the CB900F was developed based on the RCB - and now the new RSC racer was based on the CB900F! 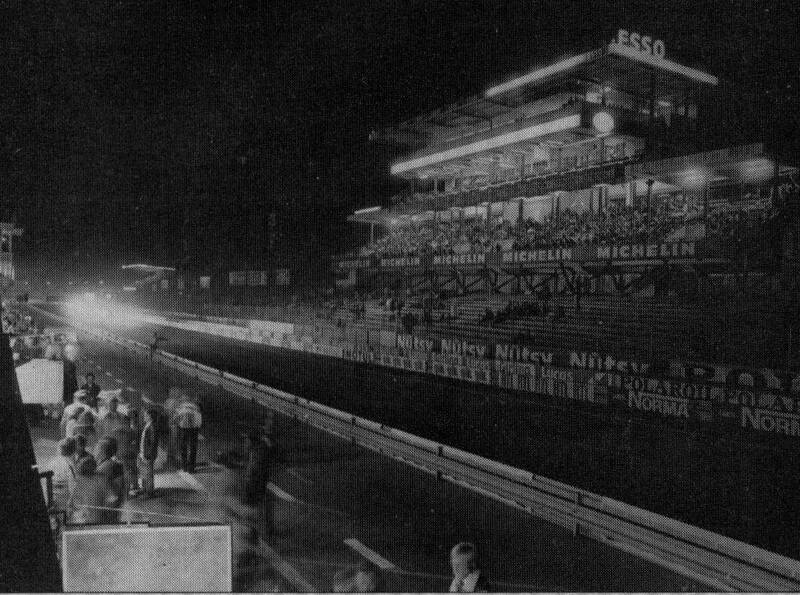 First race was the 24 hours of Le Mans - see pic at right - Le Mans by night, which was won by Marc Fontan/Herve Moineau on an RSC, - see pic at far right, followed by Peyre/Gibol on a Suzuki and Oudin/Coudray on a Honda. Leon/Chemarin retired with a seized crankshaft. Afterwards it appeared that the crankshaft was broken, something that more teams experienced. Honda changed the crankshafts to forged ones. The next race, the 8 hours of Assen, was again for Fontan/Moineau, this time with Leon/Chemarin in second position. The 8 hours of the Nuerburgring was won by Leon/Chemarin, Fontan fell off and was slightly wounded. Fontan and Moineau's team were the fastest during pit stops: 5.5 sec to tank, top-up oil and change riders! Daehne/Tost came in second on Honda. The Austrian endurance race, for the first time on the calendar, was won by Jean Bernard Peyre/Etienne Samin on a semi-works Suzuki. Leon/Chemarin retired with a broken frame, while Fontan/Moineau retired after a fall. The 24 hours of Barcelona was won by Mallol/Tejedo (Ducati), followed by Van der Wal/Struyk (Honda). Chemarin fell and was brought to the hospital, but sustained no serious injuries. Fontan's bike broke a conrod. The 8 hours of Suzuka became a debacle for Honda. Chemarin was not yet recuperated from his fall in Barcelona, and couldn't compete. Virginio Ferrari was approached by Honda to form a new team with Leon, but then Leon fell off in the training and was sidelined. The race was won by Cooley/Crosby (Yoshimura-Suzuki), followed by Hansford/Lawson (Moriwaki-Kawasaki), and Fontan/Moineau (Honda RSC). Because of heavy mist, the 24 hours of Liege became 20.5 hours, and was won by Fontan/Moineau on the RSC (see pic at left of Fontan/Moineau). Misano was won by Huguet/Hubin (Kawasaki), with Fontan/Moineau second. The battle for the world title ended with Fontan/Moineau world champions on Honda RSC, with Huguet second and Daehne third. Chemarin finished sixth, Leon ninth. The Bol d'Or, not counting towards the world title, was won by Gross/Samin (Suzuki), followed by Monin/Green (Suzuki) and Huguet/Hubin (Kawasaki). 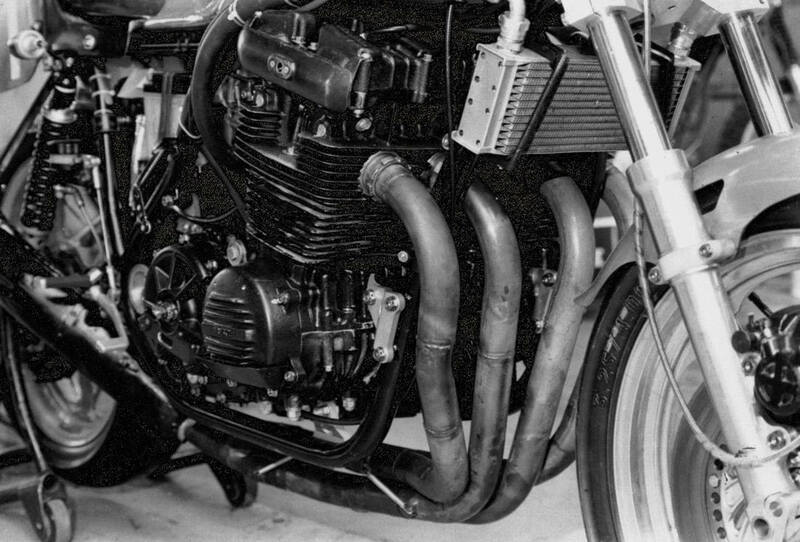 As already mentioned, the 1980 RSC racers were no longer based on the CB750 engine, but on the CB900F "Bol d'Or" (see pics at right). The 1980 FIM rules and regulations stipulated a.o. that cylinder head and crankcase castings should be equal to the ones used in the production machines, and the RCB engines based on the CB750 simply didn't comply. Bore and stroke were 70 x 69 mm for a total capacity of 1062 cc. Compression ratio 10.5 : 1. Claimed power output was still 135 bhp at 10,000 rpm. Inlet valve diameter 26 mm, exhaust valve diameter 22.5 mm. Carburettors Kei-hin VB 51 A - 32 mm CV (according the FIM rules, standard carbs had to be used). The ignition and AC generator were situated on the crankshaft ends, asin the production models, and the engines used the Morse chain camshaft drive and primary drive (albeit with a wider chain) of the production models. Contrary to the standard CB900F, the RSC had dry-sump lubrication with a double trochoid oil pump left on the gearbox. The frames were similar to the ones used in 1979. Various private teams used the "B.R.S.C." (British Racing Service Centre) versions, which had a bore and stroke of 67.8 x 69 mm for a total capacity of 996 cc. Claimed power output was 125 bhp at 9,500 rpm, torque 10.7 kg.m at 7,000 rpm. Inlet valve diameter 26 mm, lift 8.62 mm, exhaust valve diameter 22.5 mm, lift 8.14 mm. Opening angle of both valves was 255 degrees at 1 mm lift. Carburettor diameter 32 mm. Camshaft drive and primary drive by Morse chain. 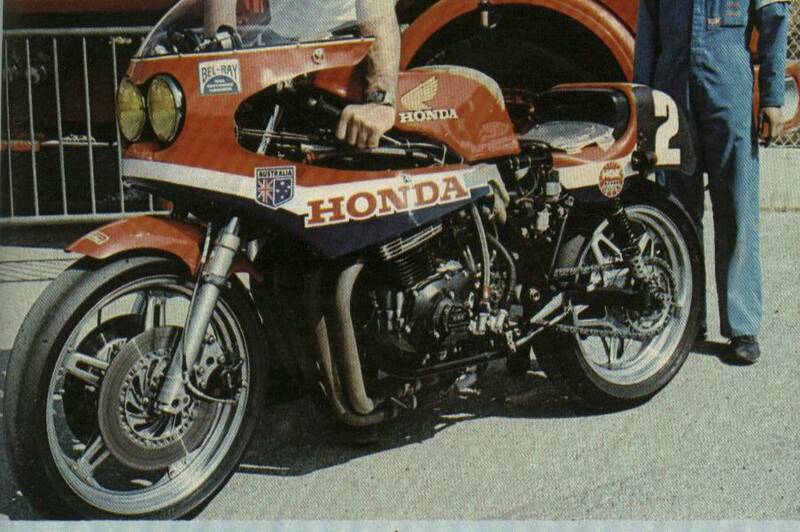 At the end of 1980, after five years' running, Honda withdrew from the endurance scene. Their supremacy of the earlier years had for a great deal disappeared, due to the new FIM rules (as usual hampering development), which gave other teams a chance to catch up, since Honda was no longer allowed to use their technical expertise to the full. However, they won the European championship 4 years running, and won the first world championship in 1980 - they had achieved everything they set out to do.